Ran / jogged / walked this event starting in Odawara and finishing some time later at Lake Yamanakoko. Weather was kind, just a blustery shower around 3am Saturday. Terrain was challenging - particularly the last hill at 95kms which was approached with a furrowed brow and the odd swear word !!!! My team finished in 4th with an overall time of 20hrs 55 mins. Highly recommended event, if you want a really hard challenge !!! 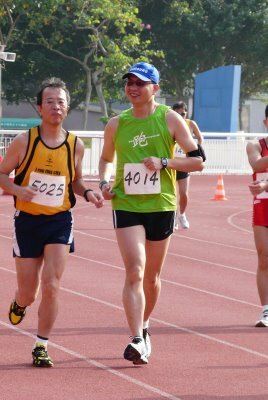 Just completed the 8 Km RRAC Summer Run ( 必達 夏日長跑 2009 ] in a moderate slow time of 42 mins in the extremely sunny and hot morning today. I really could not adapt racing in such sunny and hot condition now. Short summary : it was too hot to really run. I made it to the finish within the cutoff time of 8:00. The 50K was well organized, very low key, 120 participants, more organizers, very very hot day along the Tama river. Tamami Koike ran 10th in her age group over a wet and hilly cross country course in the Victorian State Championship on Saturday. Tuesday she ran another pb. 4 Km on the track: 17.49. Jon ran 15.48 for 4 Km on the track on Tuesday finishing 4th. I ran a pretty good race, eventhough the time doesn't show it. Placed top-ten, target achieved. Just suffered a bit from the hills and heat, but that had to be expected. Very positive to note my fast recovery, feel good today, only normal fatigue, no injuries. Also, got over the hard practice without catching a cold, many thanks to Fabrizio for the Echinacea! perfect organizing, great place, great company. Tamami Koike ran another PB. 5km in 22.48 finishing 3rd over all. Great weather and great prices made sure the turn-out for this race was as expected by the organizers. It's for a good cause, the Tokyo English Lifeline (TELL), and one participant actually managed 130000Yen in donations! Traditionally, many Namban members place in this race, and the Ladies' 10k was won by Yuri Kambara in 38:54. Jason Lawrence prevailed in the Men's 5k in a course record of 15;27.